Polycarboxylate Superplasticizers, also known as high range water reducers, are chemicals used as admixtures where well-dispersed particle suspension are required. These polymers are used as dispersants to avoid particle aggregation, and to improve the flow characteristics or rheology of suspensions such as in concrete applications. Their addition to concrete or mortar allows the reduction of the water to cement ratio, not affecting the workability of the mixture, and enables the production of self-consolidating concrete and high performance concrete. This effect drastically improves the performance of the hardening fresh paste. Indeed the strength of concrete increase whenever the amount of water used for the mix decreases. The new generation of this kind of admixtures is represented by polycarboxylate ether based superplasticizers (PCEs). With a relatively low dosage (0.15–0.3% by cement weight) they allow a water reduction up to 40%, due to their chemical structure which enables good particle dispersion. 1 High early strength: Significant increase of early strength and 28d strength. 2 Low slump lose: Great reduction of slump lose. Improved concrete cohesiveness. 3 Excellent durability: Reduction of cracking , shrinkage and creep. Superior finish. 4 High water reduction. Enhanced strength. 5 Environmental friendly products: Non pollution during production. We are manufacturers, suppliers of polycarboxylate ether PCE. This new generation Polycarboxylate Ether Superplasticizers gives early strength, and reduces water required for precast concrete. PCE is suitable for making precast concrete products with flowing-plastic or super workable concrete having very good consistency and no segregation, It givs low water to cement ratio and high strengths. SCC (self compacting concrete) is the best example for PCE. PCE is suitable for manufacturing concrete capable of self-compaction without any vibration, for making precast elements. PCE Improves surface finish giving durable precast concrete products. This is a shrinkage reducing admixture giving early strength. PCE is available as liquid and powder. 1) Poly-carboxylate is used to produce high performance, high strength and flow able concrete. 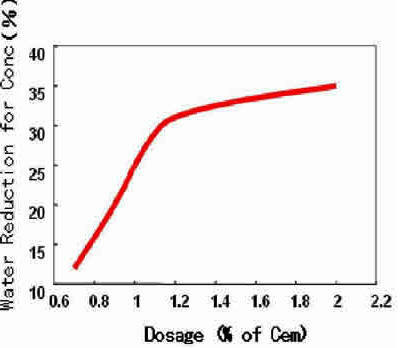 2) Dosage of Poly-carboxylate is determined according to the designated concrete mix through trial mixing. 3) Poly-carboxylate is dosed either together with water or after the addition of water. It shows more effective when Poly-carboxylate is dosed after the addition of water.